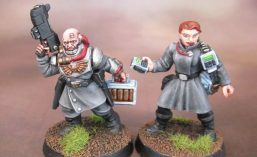 WotR | Azazel's Bitz Box. 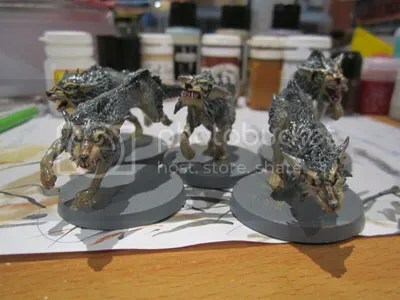 Space Wolves Fenrisian Wolf Pack. 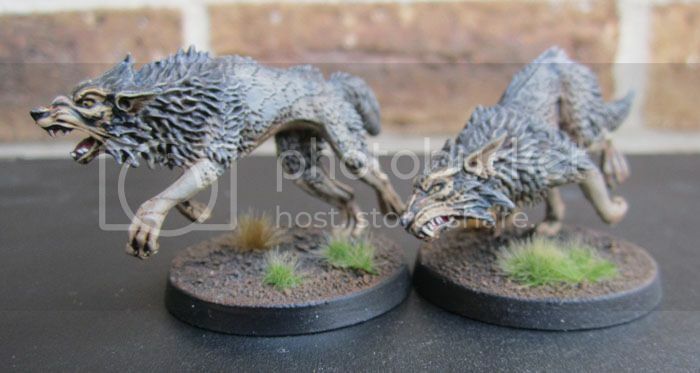 I picked up 15 of the new(ish) Space Wolves’ Fenrisian wolves off the eBay several months ago. I like the models, but I’m not fond of GW’s current pricing strategy for Australians. There are ways around it of course, and one of those I employ quite frequently these days is picking up a lot of secondhand figures from eBay. It’s also a good way to get metal models, rather than the overpriced Finecrap they’re peddling, though I’ll occasionally get those via eBay as well if the cast appears to be close enough to perfect. Not that this matters here of course, as we’re dealing with secondhand plastics. These ones were already assembled and sprayed when I got them. A little rough around the edges, so a bit of scraping got them in order, and a coat of Army Painter grey to start off my own basecoat. After some “research” time watching Nat Geo and Animal Planet docos, I’ve also seen how grey, black and white wolves seem to co-habitate the same packs, I went for grey wolves for the first batch with the following ones to be black and (probably) white. It also works to split the five unique body sculpts across 15 models, making each one slightly unique. After checking out some photos of them online I worked out how I was going to break down their colours. Some blending for both the grey fur and the warmer brown tones on the faces. I was actually quite happy with the subtle blending on the grey fur, as well as the grey on the bodies to the browns on the paws at this point, though my WIP photo here is a bit crappy. Coated with Pledge One Go/Future Floor Wax, for my first attempts at using ink washes, inspired by Chung/Wargamers Consortium’s video that can be found below. Anyway, here they are – finished! 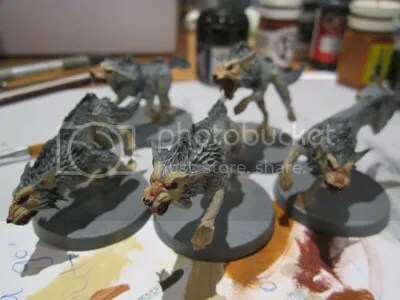 Completed Space Wolves Fenrisian Wolves. The Oil Wash was a good learning experience. I wasn’t completely happy with it, and had to do a little bit of re-blending over the top in places, but overall, the wolves came up well, especially as a quick project. I’m still a little bummed at my nice subtle fur blending being wiped out by the oils, and so it’s not a technique I’ll use for everything going forward, by any means. Still, it’s nice to have another technique that I’m comfortable enough to play with, and as I said, on cheapish eBay figures, it’s not the end of the world. I wonder how Oil Washes would behave on Bones models? Perhaps it would melt them? In the end I also opted to give them somewhat natural looking eyes, rather than (stereo) typical “evil red” eyes. 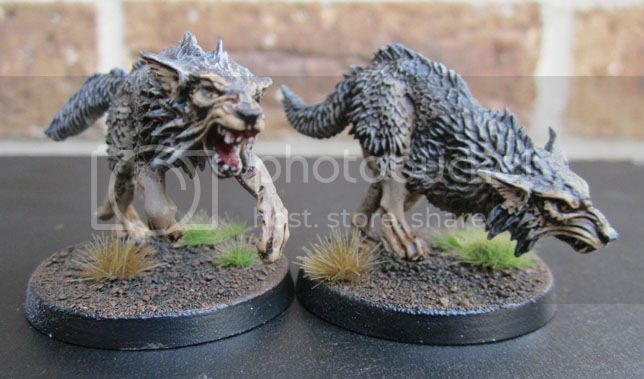 I intend to use these wolves (and the other 10, plus all those older-school ones I still need to paint) across several systems. 40k, LotR SBG/WotR, Kings of War, even (maybe) DeadZone if I ever play it (replacing those awful Mawbeasts). I found these wolves to be pretty good, but not quite as nice as I’d hoped. The poses are great (though one did have an accident when Marouda carelessly snapped it off it’s base at the ankle requiring some pin vice surgery and more overpainting – I was well pleased with that) – so as nice and dynamic as they are, the poses are a bit fragile. The tails not being a separate piece, is a nice change from the older models, so they’re less likely to break than the previous wolves. What I’m not so keen on however is the fur on the side of their torsos and upper legs. Clearly a result of digital sculpting rather than more traditional methods, they’ve overlaid a “leaf” pattern of fur (more visible in my first and third photos) rather than sculpting the whole of the bodies in a more traditional manner, as they have for the manes.